Stella Deus: Gate of Eternity (PS2) Review - Game Reviews | Squackle.com! The Funniest Site on the Net! 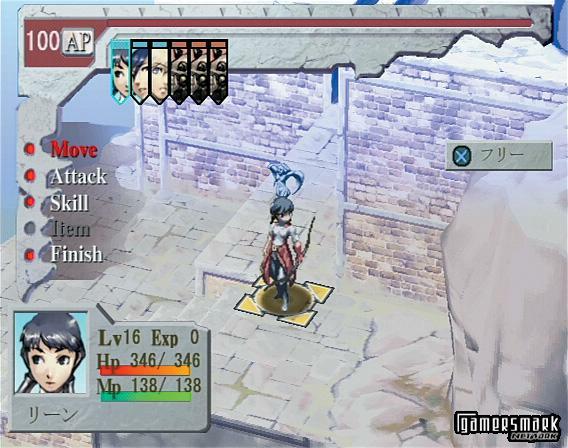 Stella Deus: Gate of Eternity is Atlus’ new strategy RPG for the PlayStation 2. Taking place in a world where all the regular enemies you see fall into around 15 different classes (each class having only one sprite model so you’ll know what they are), you’re in for many long hours of strategy “fun.” Well, not really “fun.” Between instances of unfulfilling storyline full of bad voice acting, you’ll find yourself having to level up for about an hour, which definitely becomes a chore at times. I’m not going to lie; I really thought the setup of the world and story in Stella Deus: Gate of Eternity was actually very interesting. Unfortunately, the game didn’t live up to my expectations. Maybe it was the bad voice acting or the excessive use of dialogue devices that annoyed me (including, but not limited to, just saying a name and having to guess what they mean by just saying someone’s name or trailing off in their speech and not completing it). It seemed like at times the story was written in a way that I had to read the storyteller’s mind to understand what they were trying to imply in the context of the events. However, the main fault of the story is that it took too many predictable turns, making the game seem more run-of-the-mill than it really should have been. 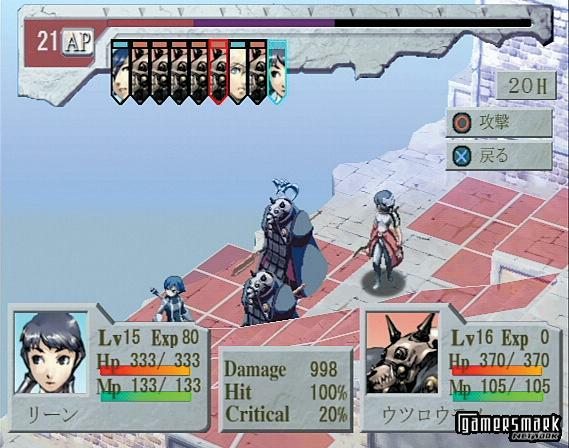 The graphical style used in the game more closely resembles Japanese anime than cel-shading found in most games that try to achieve a “drawn” look to them. While I didn’t have any real complaints about how the game looked like in this regard, my roommate gave his generous opinion and basically said it looked like crap, as if “some kid finger-painted that ****.” I can see how the art style might not appeal to everyone, but I personally think that the graphics are more or less nice to look at; however, you can tell the colors are kind of bland, and nothing really jumps out at you. Dedicated story scenes are most of the time delivered in still shots of characters with backdrops behind them. There are different pictures depicting interesting interpretations of emotions as well, for example, bugging out of the eyes when mad/disgusted. The character art is fairly well drawn, but you will never see more than one (if there is one displayed) character in a story scene at the same time, as the pictures will jump back and forth between the conversing parties. Not that this is necessarily bad — it just leaves out certain characters’ appearances through parts of the story and you’ll begin to wonder if they’re even there. Sometimes they’ll leave a character out of a whole conversation and then insert a part where that character pops in and has “…….” as what they say, just to give you the feeling that they are there and listening, I suppose. Sometimes you’ll see story delivered in in-game animations. There are practically no Full Motion Videos (FMVs), either. When it comes to actual game play, Stella Deus doesn’t get much more generic. All the basic principles of strategy RPGs are there and not much more to build upon. Typically, you gain Exp and SP after each action you make in battle. Depending on your level and whatever formula the game has, you’ll gain a number amount anywhere from one or more Exp/SP for each action. Exp is used to increase levels and SP is used to increase abilities or gain skills. To achieve the next level for a character, one needs to gain 100 Exp, and it doesn’t matter what level you are. The amount of Exp you gain correlates with what level you are, meaning an action you gained ten Exp for at level five only gets you one Exp at level 10. A fault (or maybe it was on purpose) of the Exp system becomes apparent when you get closer to the 100-Exp-threshold. For example, if a character has 98 Exp and you defeat an enemy, gaining 62 Exp for doing so, you’ll in effect lose 60 Exp points, because once you get to 100 or more, you start at zero instead of having the Exp rollover and start at 60 exp. This is annoying to say the least. SP is gained in a similar fashion, but instead of the problem you have with Exp, you never have enough SP, making it a potential chore to have to battle a bunch of times, outside the course of the main story, to get enough SP to do whatever you wanted. SP is used to learn new skills, and to gain more base stats (if you ever wanted to waste them like that). There are a couple of unique things that Stella Deus: Gate of Eternity brings to the table, however. The most unique, dare I say innovative, aspect of the game is how you are able to control your characters during battle. You have two choices in the options menu, one is “Command” and the other is “Direct” for your controlling preference. Command is the usual menu-based control scheme in strategy games that list all the possible things you can do (like Move, Attack, Item, etc.). The control scheme known as Direct takes these commands and assigns them to particular buttons on your controller, allowing you to conveniently accelerate the pace of the battle. Cutting down the time of each turn you have your characters take makes the game less boring, in a way. Other interesting aspects of the game are Team Attacks and Zone Skills. Team Attacks allow you to combine forces with another character in your party to deal some serious damage on your enemies. The game almost forces you to take advantage of Team Attacks, because the levels get progressively harder faster than your characters develop (without practicing in battles a lot). Depending on who is in the Team Attack (which seems like it could be up to five at a time), they do different types of attacks. Zone Skills are also an interesting part of the game, as you can affect the status of your characters or the status of your enemies depending on the skill you use. Possible skills include Healing (for your characters) or a chance of inflicting the status of Fear on your enemies, and as long as either is in your character’s “zone” they may take effect. 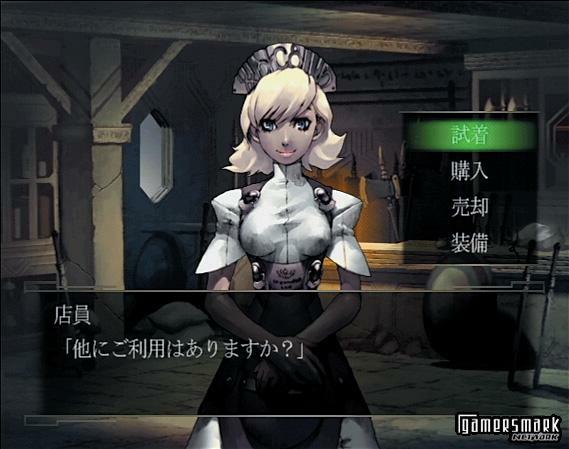 There are also some side-quests available in the town portion of the game. Seemingly, each town you go to is an exact copy of all the other towns in the world you visit, and every person looks the same, too. Actually, the “town” is just the same “town” you go to each time you go to the “town,” meaning there are no unique towns in the game. The side-quests break up the linearity of the story, and gives you something else to do than go to the Catacombs (where you practice your battling to gain Exp and SP, going to increasingly deeper levels with harder battles). You’ll find different quests that simply make you go somewhere with an item, have a battle somewhere, or do something that’s pretty much stupid. You can acquire interesting items and new party members (although they stem from the enemy sprite pool, but at least you’ll only get one character for each class of enemy) for doing the mini side-quests, and since they really don’t take that long, it may be worth your trouble. When it comes to sound, it’s not the game’s strong point. While the music is OK to listen to, it can get kind of monotonous, especially when you constantly have to listen to the same song during battles, and you’re in battle 90% of the game; basically, not much to choose from. The sound effects are average at best. All of your enemies use the same set of voice-overs for their cheesy quips they say before and after an attack, and all the unique characters in the game (who don’t share the same character model as one of your enemies) have their own voice-overs that are equally as cheese-filled. When it comes to regular story voice-overs, the voice-overs are bad. There are a couple of main characters that have moderate or even good voice-overs, like the characters of Viper and Grey. It gets to the point where you can tell which characters have the same person doing the voice-over because they sound almost the same, or you can tell by their abilities as a voice-over actor/actress. While they do get the job done, it leaves a bad taste in the mouth sometimes. It also doesn’t help that a line of speech randomly has lower volume than the other lines being spoken. Though it doesn’t happen often, it happens enough to mention. To veterans of RPGs and strategy RPGs, Stella Deus: Gate of Eternity may be an underwhelming experience, but it doesn’t go as far as to completely disappoint. Most of the elements that have made strategy games good in the past are present, and if you’re looking for a game to feed your strategy RPG yearning, Stella Deus: Gate of Eternity wouldn’t be a bad choice. The game can get rather involving to a point, and could spark interest as to where the game’s story will lead, but all in all, you’re not going to find anything else that is very different from most other strategy RPGs.